← When Your Holidays Need a Little Less Cheer and a Little More Fear, Bring in the Krampus. I’ve been fortunate to grow up in an era in which character ornaments have been commonplace. Heck, in 2012, it’s a great time to be a child of the 1980s. In Hallmark stores alone, there’s a DeLorean Back to the Future ornament, a Stay Puft Marshmallow Man ornament, AND a Thundercats Lion-O ornament, in addition to the usual assortment of Star Wars, Star Trek, Disney, and Marvel and DC superheroes that are offered year after year. While Hallmark seems to have a monopoly on well-made pop culture ornaments these days, it hasn’t been too hard to find Christmas ornaments of your favorite characters for quite some time. I think the success of the Star Trek and Star Wars ornaments in the early and mid 1990s showed that geeks don’t want snowmen or angels or Santa gracing their tree if they can spend their money on something much nerdier instead. 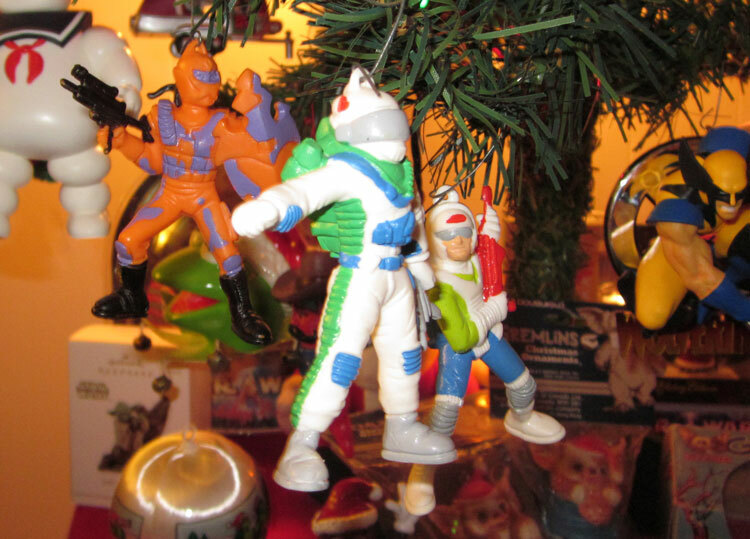 However, if you grew up in the 1980s and early 1990s like me, getting characters on your tree was much more of a challenge. Sure, I’ve had Disney, Warner Brothers, and Sesame Street characters on my tree since I was very, very young. But finding ornaments based around “action heroes” (not just action figures, but fictional heroes of my youth) is fairly challenging. I had a few as a kid, like Michelangelo from the Teenage Mutant Ninja Turtles building a snowman, but it was the exception to the rule. In recent years, I’ve come to appreciate these types of ornaments more, and so I was thrilled when I found three ornaments based on characters from G.I.Joe: A Real American Hero (ARAH) posted on a message board earlier this year. Standing a couple inches tall, these are ornaments of Dee Jay, Countdown, and Alley Viper from the 1989 batch of new ARAH figures. If you love G.I.Joe, I’m sure you were expecting me have ornaments of Duke, Snake Eyes, Storm Shadow, Cobra Commander, Destro, Baroness, or any of the other myriad of far more memorable members of the Joe and Cobra teams. Hence, these ornaments are a bit of a mystery to me. Even in 1989, there were new versions of Snake Eyes and Rock N’ Roll. My first thought was, “Well, if it was 1989, maybe whoever made these ornaments was simply trying to promote some of the new and exciting characters that kids are sure to love!” That hypothesis was quickly refuted when I saw that all three ornaments were dated 1991, two years AFTER these third-tier ARAH characters premiered. Additionally, these ornaments are copyrighted “Hasbro,” although that copyright might represent the company that owns the rights to ARAH and not necessarily the manufacturer of these ornaments. I cannot find any information on these ornaments and whether there are more in the set. This is such an odd combination of ARAH characters that I feel like more popular characters had to be represented as well. If you have any information on these ornaments, please let me know! Regardless of how these ornaments came to be, I currently have them proudly displayed on one of my Christmas trees this year, and I plan to do the same for many years to come. This entry was posted in 1980's, 1990's, Action Figures, Ben, Christmas. Bookmark the permalink. Just awesome!!!!! I have never seen these, they are really cool. I’ll be looking for them now, thanks for sharing the pics. I am so jealous of that Alley Viper. Found this Duke on Amazon. Looks like Kurt Adler made a series…possibly for american greetings in the early 90s.